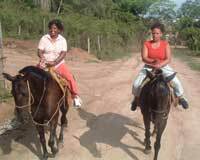 This is a ride for experienced horseback riders. The reason is that if you're not experienced enough to know the proper riding technique, you'll be very sore the rest of your vacation. However, if you're used to riding, this is a great trip. Ride deep into the dense jungles of the Sierra Madre, experience breathtaking views of Puerto Vallarta below, and likely see wildlife. Includes: Mexican Lunch, and a stop at the River Pittillal for swimming. OUR ADVICE: Don't do this one if you're a beginner. You'll be really sore the rest of your trip, and your backside will hurt!